Few things can shake a parent up more than when their child is in pain. If you’re a migraine sufferer with a child that is complaining of a headache, it can be even more unsettling because you know firsthand how bad that pain can be. Yes, headaches and migraines remain one of the most common health complaints from children. In fact, close to 10 percent of children and an even higher percentage of adolescents have suffered a migraine attack at some point in their life. Also, migraines carry a strong genetic basis, meaning that they tend to run in families — so if you suffer from migraines, don't be too surprised if your little one does too. What are the Symptoms of Migraine in Children? Are Childhood Migraines Just Like Adult Migraines? Unlike adult and adolescent migraines, which tend to be painful on one side of the head, childhood migraines may be felt across the front of the forehead or on both sides of the head. In some instances, a pediatric migraine may also cause abdominal pain, vomiting, or vertigo. It's interesting to note that while women tend to suffer migraines more than men in adulthood, during childhood the youngest migraine sufferers tend to be boys. After puberty, girls tend to have more migraines than boys. What Triggers Migraines in Children? What Can Be Done to Treat My Child’s Migraine? Take your child’s complaints seriously and work with a pediatrician who will also take your child’s complaints seriously. Your pediatrician will ask you and your child questions about his headache and conduct a physical exam. A MRI or CT scan of the head may be required to determine if there are any structural changes to the brain. If there are any abnormalities, your child may be referred to a specialist or pediatric neurologist. There are some medications that might be beneficial to treating migraine in children. You may be told to give him children’s ibuprofen or acetaminophen for pain. Please note that aspirin should not be given to children under 15 years old because it can lead to a syndrome called Reye's syndrome. A supplement or prescription of low-dose antidepressants or anti-seizure medications may also be helpful for your child in preventing migraines. This all being said, it's important that you not administer any medication to your child without first consulting with a doctor. Continue remaining an advocate for your child's migraine health. By taking an active role and creating a preventive and therapy plan with your child's doctor, you are already helping them. Abu-Arefeh I, Russell G. Prevalence of headache and migraine in schoolchildren. BMJ. 1994 Sep 24;309(6957):765-9. National Headache Foundation. 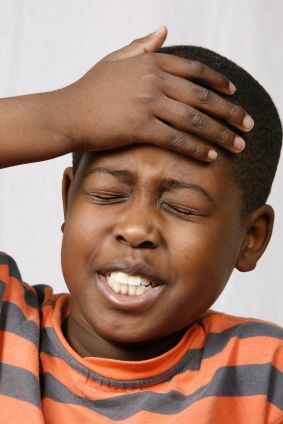 Children's Headache Disorders. Retrieved December 22nd 2015. Winner P, Hershey AD. Diagnosing migraine in the pediatric population. Curr Pain Headache Rep. 2006 Oct;10(5):363-9. Winner P. Childhood periodic syndromes and migraine. Curr Pain Headache Rep. 2005 Jun;9(3):197-201.